You have heard a crash from another room, you silently leave your bed and have to move to where your weapons and or gear are, but are you ready? Alright ninjutsu practitioners, here is another lesson for you to add to your routine practice. This one will involve familiarizing and moving throughout your household in total darkness. Step 1: All lights are off and curtains drawn so as to prevent outside ambient light from entering the rooms of your home. Step 2: Move as silently as possible from room to room. If you have a family have them join in on this exercise. At this point in the exercise if you have weapons hidden in your home or have an escape plan in place, now is the time to see if you can reach them or escape in total darkness. Step 3: With the lights out concentrate on your other senses to help guide you through your home. Step 4: After exercise review with all participants and ee what the weaknesses were. Who was the loudest? Were you able to get to a safe area? Were you able to secure your weapons? Review and practice this exercise to increase your night movement skills within your home, it may save your life in the future. Life and death are connected. Like In-Yo (Yin & Yang). This is my teaching theme for the year. Like a magnet and metal, life and death are attracted to each other, always getting closer. If you are born and given a life, death is inevitable. When death comes do not be surprised or shaken. Get on the rhythm of life. Get in balance with it. This is the theme of the year. That is why I tell my students it does not matter how skilled one becomes in martial arts or even Ninjutsu for that matter, if one can not attain this balance or rhythm. This is the basis for the Kihon Happo! Not the forms! Jiyu ni, atarimae ni, Jibun de narai, jibun de ikiro! Freely, with common sensibility, learn on your own, live on your own! Even though I have many students, I do not need them, but they still come to see me right? This is because I teach them how to teach themselves. This is why they come to me. But this is very different from just making up a Ryuha and such. This is the real path I teach. All around me I have many strong friends from many countries. Most of them are people who had to survive wars in their own homelands. They are all the real thing, real warriors. We understand each other on a certain level. My training with Takamatsu Sensei has made me aware of these types of people. It is like we are our own species. Even you Sean, you had to fight for your own survival on several occasions, right? You even got stabbed from behind. You had courage and a keen mind to help you survive. But your poor opponent! Ha ha ha!!!! Bad guys are always planning something devious. They are “big idea” people, always coming up with some kind of con. But it is important to develop the mind to withstand these types of people, learn to perceive them. My way is to never think about anything at all. You know me, I am usually not really thinking about any one thing in particular. It is just a matter of “keep going”. This is the best way to guide your students. This is the way it is when you train with me. When my senior Japanese students make mistakes and go astray I get on them and scold them. It is the same with all my students all over the world. I have no borders. I do not hold anything back from the non-Japanese. I do everything on a man to man basis. This is the way it has always been. If I do not teach this way my students may be killed when the time comes. It would be very sad for me. This is why I do not teach in a strange and unnatural manner. I teach people to teach themselves… freely! “In the old days, there were no pharmacies. You had to know how to create your own medicines and cures. Therefore, the ninja had to know how to do such things himself. Today, however, you can get medicines from a drugstore. As for homemade gun powder, it is so dangerous. It is not safe to make such things in your home. You do not need to know how to make it. You do need to study subjects like chimon (geography) and tenmon (weather conditions and star patterns). There are so many things that you should know besides taijutsu. As for poison, you may not be able to use poison formulas from ancient times. Many things were regarded as deadly poisons because there were no antidotes in the old days. Today, many drugs we have, take away the deadliness of what was a poison yesterday. 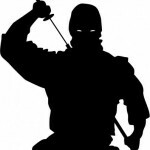 Now, the tagline on this website and my personal training philosophy is “Taking the powerful ancient ninja strategies and techniques and utilize them in real world, modern applications.”. Sensei Manaka’s words hold so true to this it almost scared me when I came across this writing in my notes from the 90’s. In many of the free blog lessons presented here, I have always taken the “traditional” and applied it to a “modern” situation. Without doing so, the art of ninjutsu would become stagnant, and wither and die. Even within the “taijutsu” skills, a modern practitioner must incorporate a realistic approach to their training, applying the fighting skills in the ring against a live, hitting opponent. Why would your other skills that derive from the Ninja Juhappan, be stagnant? They shouldn’t and that is why you will always find a modern application being taught here! So, before you go to your next practice, or begin to learn a traditional strategy, think how would you translate this into something you will use in today’s modern environment!. During your training in Budo Taijutsu, you will transition through many stages. Along this path, you will have to overcome many obstacles that hinder your progress. Many students wonder about what to concentrate on, or what is right or wrong at each of these stages. They see us training on the kihon happo, and various henka, and ask me “what is right?” The answer is shu – ha – ri. To grasp the principles contained in shu – ha – ri, you must start at shu(Protect). Through diligent practice, a student (and we are all students) will gain an understanding to the insights of true budo. Not any one technique or principle, but all and none applied to the purpose of your self protection. “What is called the spirit of the void is where there is nothing. It is not included in man’s knowledge. Of course the void is nothingness. By knowing things that exist, you can know that which does not exist. That is the void. In the Way of strategy as a warrior you must study fully other martial arts and not deviate even al little from the Way of the warrior. With your spirit settled, accumulate practice day by day, hour by hour. Polish the twofold spirit heart and mind, and sharpen the twofold gaze perception and sight. When your spirit is not in the least clouded, when the clouds of bewilderment clear away, there is the true void. Until you realise the true Way, whether in Buddhism or in common sense, you may think that things are correct and in order. However, if we lood at things objectively, from the viewpoint of laws of the world, we see various doctrines departing from the true Way. Know well this spirit, and with forthrightness as the foundation and the true spirit as the Way. Enact strategy broadly, correctly and openly. Twelfth day of the fifth month, second year of Shoho (1645).